CoverMyMeds recently announced a new product, RxBenefit Clarity (RxBC), in conjunction with RelayHealth Pharmacy Solutions. Both companies are part of McKesson Rx Technology Solutions. RxBC is an interesting new solution, which could well revolutionize the world of electronic prescribing (e-Prescribing). RxBC addresses a significant challenge in e-Prescribing today: a lack of clarity regarding the patient’s prescription coverage for individual drugs. Traditionally, the information available to the pharmacist at the point of dispensing is very detailed as well as specific to both the patient and the drug that was prescribed. The information available at the point of prescribing is sourced differently and is not patient specific. The result is that prescribers frequently order medications that are not on formulary, have higher copayments, or require prior authorization – all because they don’t have visibility into these limitations. The reasons for this disconnect are varied. However, a major cause is the information gap between pharmacy and prescribing systems. 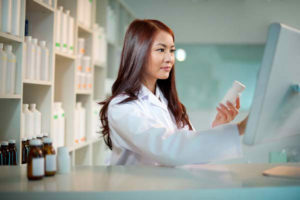 Pharmacy automation is designed for dispensing, where detailed information about the patient’s insurance coverage is required to ensure reimbursement. In contrast, the ePrescribing automation used by the physician is part of the electronic health record (EHR), which is designed primarily to document care and does not require detailed information about insurance coverage. RxBC changes this dynamic. CoverMyMeds has duplicated the data stream about the patient’s insurance coverage that is available to the pharmacist and made it available to the prescriber as well. Using RxBC, the prescriber has immediate access to formulary status, copay amounts and coverage restrictions such as step therapies or prior authorization. Having this information will make it possible for providers to order medications that are covered, affordable, and approvable by the patient’s insurer. This will help ensure that the patient initiates medication therapy more quickly. What remains to be seen is if there is demand from physicians for this information. Clearly there is a patient benefit to having a covered, affordable and insurance-approvable prescription. This patient benefit will be achieved if physicians are willing to invest the time to review all of these details. There may still be some physicians, though, who see such issues as the role of the pharmacist. We believe that this perception is rooted in the sub-par data that is available in the EHR today. If so, that perception should change once RxBC achieves wide-spread adoption. Interested in how the ePrescribing world is changing in regard to formulary and benefit information? Contact me at michael.burger@pocp.com.